You're Cloud, standing in the middle of an ancient city, surrounded by crystals and conch shells and crystallized conch shells. Your hair is irresponsibly spiky. 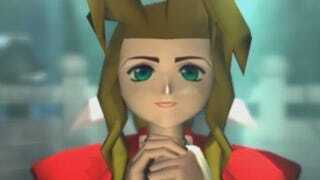 Before you kneels Aeris, that flower girl you're sorta kinda crushing on. Her eyes are closed. She's praying. Whoosh. Down comes that douchebag Sephiroth, his giant sword pointed directly at Aeris's back and— oh. Oh god. She's dead. The camera slows down. You watch her body crumple as she falls to the ground. Only thing you can hear is a thumping heartbeat. You're paralyzed. She's not really dead, is she? She can't be. You want to cry. Not yet. A white orb falls from her body and starts soaring up, then arcing down. Camera follows. The orb falls toward one of the nearby pedestals. Slowly. Gently hits the ground with a clink. And then. Then. Aeris's Theme starts to play. Break out the tissues. It's bawling time. While Final Fantasy VII's infamous plot twist is packed with terrifyingly powerful emotions, the crowning moment of Aeris's death is not the second she's unceremoniously stabbed in the heart. That's just setup. The true wallop, the true catharsis comes when her song starts to play, when your ears register what's going on. The slow, soft piano melody that serves as both her introduction and her epitaph. That's the moment when her demise feels real. You didn't cry when Sephiroth stabbed Aeris. You cried when you heard that song. Go ahead and watch for yourself. Director Yoshinori Kitase took an economical approach to crafting this wonderful, harrowing scene. There are no shots wasted. You have just enough time to stare at your screen in utter shock before the music starts up. Watch the way the camera closes in tightly on Aeris's utter disbelief, on Sephiroth's smug satisfaction. Listen to how the white materia clinks, slightly out of sync with the music's rhythm, creating an uncomfortable dissonance that sticks with you for the next few hours, and weeks, and months, and years to come. Final Fantasy VII isn't alone here. When we think about our favorite Japanese role-playing games, we think first and foremost about their musical scores. And even the genre's harshest critics can't deny that the music in JRPGs tends to be nothing short of phenomenal. From the wacky beats of Persona to the grand, oceanic themes in Chrono Cross; from the haunting melodies of Legend of Mana to the triumphant victory themes that can make you feel like you just won the Super Bowl, JRPG music knows how to burrow into your earholes and never come out. It's sometimes hard to tell whether a song has emotional weight on its own or because it is attached to powerful moments in a game. Take Xenogears's "Faraway Promise," for example. If you've played the game and experienced its stunning story, this song will evoke memories of transcendent love and eternal sorrow. If you haven't, well... it's just another cool song. But here's the catch-22: would Xenogears's story be nearly as powerful or memorable without tracks like that? If not for Yasunori Mitsuda's beautiful melodies, would you still care about Fei and Elly's struggles? Would you still get as pumped to fight unrelenting battles? Would you even bother playing the game? When I think about my favorite JRPG moments, my mind immediately jumps to their sounds. The slow walk down the staircase of Daryl's Tomb in Final Fantasy VI, punctuated by a slow rendition of wandering gambler Setzer's airship theme. The melancholy piano transitioning to a drum beat and then sudden silence when a certain character dies in Suikoden II. Beginning your adventure in Final Fantasy IV. More than any other genre, JRPGs live and die by their soundtracks. Their powerful moments are made even more powerful by the sweeping, haunting, lovely melodies attached. Grand adventures rendered even grander. Frantic battles feel more urgent, more dangerous. So maybe the most important part of a JRPG isn't its story, or its combat system, or its graphical engine. Maybe the most important part of a JRPG is its soundtrack. After all, that's the part that makes you cry. Dragon Quest X is hitting Japan this August. Will it come to America? If it does, will anybody care? The world may never know. It's amazing what a huge difference a single mistranslated Final Fantasy line can make. This RPG Kickstarter looks pretty damn cool. Here's your first look at the upcoming Devil Summoner Soul Hackers remake for 3DS, which will be out in Japan later this year. Persona 4 trailers! Persona 4 trailers! Lunar: Eternal Blue Complete, a PlayStation game that mastered the art of awesome soundtracks. Comes complete with charming dialogue, an adorable story, and one hell of a sidekick-slash-flying cat thing. I love your columns and i can't wait to read your weekly ruminations on JRPGs over at Kotaku now. One topic i hope you get to cover is the evolution of the series Final Fantasy from VI - XIII-2. I grew up on the prime days of Final Fantasy. 6 - 10 were released in my days of middle school through high school. I Loved the turn-based format, the engrossing stories, and the limitless potential of the games. The culmination of the battle system coming together in FFX remains one of my favorite battle systems of all time and the rapid change in the series following X is understandable but i'm still holding out hope for a return to the turn-based combat found in earlier Square releases. XIII's frenetic pace and paradigm system is fun and challenging but after testing the waters of the MMORPG world and settling on the linear direction and fast paced action RPG system in XIII i'm worried we'll never see a return to the classics. You know, while I don't think very much of Final Fantasy XIII, I do have a lot of respect for Square Enix's willingness to embrace innovation. Every Final Fantasy has brought a host of new mechanics to the table, from IV's real-time turn-based hybrid ATB system to XIII's class shifting chaos. And we have no idea what Final Fantasy XV will be like. We know nothing about its world, its characters, its setting, its battle system, its summons, its dungeons, or its themes. All we know is that it will have a guy named Cid and maybe some chocobos or cactaur. That's kind of awesome. So to address your concerns: No, I don't think Final Fantasy will ever return to its "classic form," and I think that's okay. As much as I loved those SNES and PlayStation 1 offerings, I think it's great to see one major video game series that isn't afraid to pursue innovation, even when it doesn't really work. And if I want a classic RPG, I'll play Dragon Quest. How's this for a topic: Alternative JRPGs. Any recommendations for a JRPG fan who's tired of the same tired old format of JRPGs that he once loved to death? My recommendation is The World Ends With You, one of the most unique RPGs I've ever played. How about you guys? What unique JRPGs would you recommend?